ALAMEDA, Calif. /California Newswire/ — The Pacific Pinball Museum (PPM) of Alameda, California is pleased to announce that PPM has been chosen as a recipient of a grant from the Neotrope(R) 2012 Non-Profit PR Grants Program. With this commitment, Neotrope aligns itself with the PPM in educating and entertaining children and adults through the preservation of pinball, while making eight decades of games available to be played by everyone. This grant will help the Pacific Pinball Museum further its mission: "To inspire an interest in science, art and history through pinball and to preserve and promote this important part of American culture." The museum accomplishes this through the operation of the Pacific Pinball Museum, a beautifully maintained selection of 90 fully playable pinball machines. In addition, PPM hosts the world's largest pinball show: the Pacific Pinball Exposition once a year. PPM also furthers its mission through the creation of traveling pinball art and science exhibits that capture the amazing visuals and communicate the basics of physics and electricity used in pinball. "Neotrope's recognition of PPM's dedication and focus in addition to their work with other charities and nonprofits is truly appreciated. 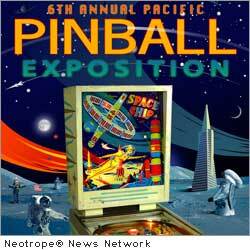 Neotrope will be invaluable as we plan the world's largest pinball show: our sixth annual Pacific Pinball Exposition for September 21 – 23, 2012," said Larry Zartarian, the Museum's Chairman of the Board. Americans instantly recognize pinball as an American icon along with Jazz, Coca-Cola(R), the jukebox and Elvis. The PPM ensures future generations can appreciate the American ingenuity and creativity that fueled an entire pinball industry for years to come. The museum is currently developing curriculum for students of all ages to learn the basic theories behind pinball mechanisms and concepts such as gravity, momentum and acceleration. As part of this grant program, Neotrope is providing PR solutions, news dissemination (through its Send2Press(R) Newswire service), and search marketing for the PPM to help raise awareness of its efforts in education, community service, science, art and fundraising. The museum's goal is to move to a permanent location that can house its collection of 900-plus machines, offer larger teaching and restoration facilities, and expand its art gallery that features local and international artists. "Having Neotrope aboard will help drive and refine our vision to become the Smithsonian of Pinball," said Michael Schiess, PPM Founder and Director. "Our growing team of artists, technicians, volunteers, enthusiasts and visionaries will now be able to spread the word and scope of their efforts." "We're honored to be providing assistance to the Pacific Pinball Museum, in both keeping alive eight decades of pinball history, and building educational art, science and historical programs that spark interest in intellectual pursuit," said Christopher Laird Simmons, CEO of Neotrope(R). PPM unlocks the imagination of visitors with pinball back glass art that features themes such as fantasies of the future, beautiful women, sports heroics, outer space, the Wild West and many more. A key member of the museum's collection of one-of-a-kind exhibits is the Visible Pinball, a fully functional pinball machine housed in a clear cabinet. The Visible Pin mesmerizes anyone who has ever wondered what goes on inside a machine while it's being played and gives instructors an opportunity to point out the details of the machine's operation while it is being used. Other exhibits discuss magnetism, momentum, statistics and the patented inventions that several ingenious Americans have devised just for pinball. Giant (sometimes 10-foot by 10-foot) hand-painted acrylic mural reproductions of original pinball back glass art cover vast swaths of PPM's walls. From Space Ship to Sea Ray, from Majorettes to Jungle Princess, these unique pieces of art created just for PPM are also available as an off-site exhibit or simply as an eye-popping example of the depth of skill pinball artists and designers employ while promoting individual games. Artists working at pinball companies Gottlieb, Williams and Bally unintentionally captured highlights of history while designing the art that decorate pinball games. Christian Marche's pointy people and Gordon Morison's over-the-top psychedelia capture the mood of the '60s and '70s while the content of various pinball artists' work often captures historic moments like the moon shot, the British rock invasion or the patriotic spirit following World War II. PPM is popular with families, couples on their first date, school groups and local companies who hold special occasion parties there. The museum offers a party room for rent by the hour while guests enjoy the historical selection of games that range from 1878 to 2012. Parties at PPM are like having access to an entire arcade or someone's massive game room to celebrate a personal occasion. Also among the regulars at PPM are some of the world's highest-ranked pinball players and most experienced repair technicians. For more information on the Pacific Pinball Museum, located at 1510 Webster Street, Alameda, CA, 94501, visit www.pacificpinball.org or write to mschiess@pacificpinball.org or call 205-9793. For more information on the Pacific Pinball Exposition, visit: http://pacificpinball.org/events/ . Since 1983 Neotrope(R) has delivered services to raise organization awareness including brand identity, marketing, public relations (PR), and SEO services. Neotrope is also an entertainment publishing company involved in books, music, software, and online content portals. Neotrope also offers targeted news dissemination and press release writing through its unit, Send2Press(R) Newswire (Send2Press.com). The company pioneered the concept of search optimization of press release content back in 1997 (verifiable via archive-dot-org). Neotrope was an Inc. 5000 company in 2009. More information: www.Neotrope.com . Neotrope's annual Non-Profit PR Grants(TM) Program was originally launched in 2000 by company founders Christopher Simmons and the late Dr. JL Simmons, with the goal of providing a "better donation" for worthy U.S. charitable 501(c)3 non-profits than simply writing a small check; instead utilizing the company's capabilities to grow awareness to media and the public, attract halo sponsors/donors, and bring together disparate resources not generally affordable to small organizations. Additional information regarding the Neotrope 2012 PR Grants for U.S. charitable non-profits and grant recipients can be found at: https://www.send2press.com/non-profit/index.shtml .